Heart of God Church – a place where family become friends, and friends become family. Note: The following is my detailed account of Pastor How‘s message over the weekend of 4th & 5th December. Pastor Tan Seow How & Pastor Cecilia Chan, more affectionately known as Pastor How & Pastor Lia are the senior pastors of Heart of God Church – my spiritual home. Miracles – we all need them. Be it in the small or big things, we find ourselves constantly hoping for miracles to happen. That sickness, that result slip, that crush. Haha whatever it is, considered legitimate or not, these “miracles” are a part of our lives. In fact for some, being alive every single day is a miracle by itself. But away with our own concept of miracles. It’s time to know what the Bible says about them. We know that faith is the opposite of fear. And often we hear people telling us to “have faith” when we have doubt. Having faith is crucial to breaking out of doubt, but sometimes an insufficient answer to our questions. So what do we do when we have doubt? I’m at a shop, checking out a $300 guitar pedal. I’m not sure if I really want-want-want it. I’m unsure if it’s well-built or cheaply soldered together on the inside. I’m really tempted to buy it, but there’s still some doubt lingering about in my mind. In such a situation, I always find myself doing the same thing. I walk away from the store, and I start googling. I search “(product name here) review” in an attempt to convince myself of how good or bad it is. Let’s look at the user reviews – I want to know what others say about the company, and their after-sale support. A bad review pops up. But it’s obvious the person is a professional 1-star reviewer. I take a look at the good ones, not the biased ones, but those who point out objectively what’s great about it. Usually, I find that I’m already biased, depending on how much I like the product. I find myself already taking sides according to my bias. 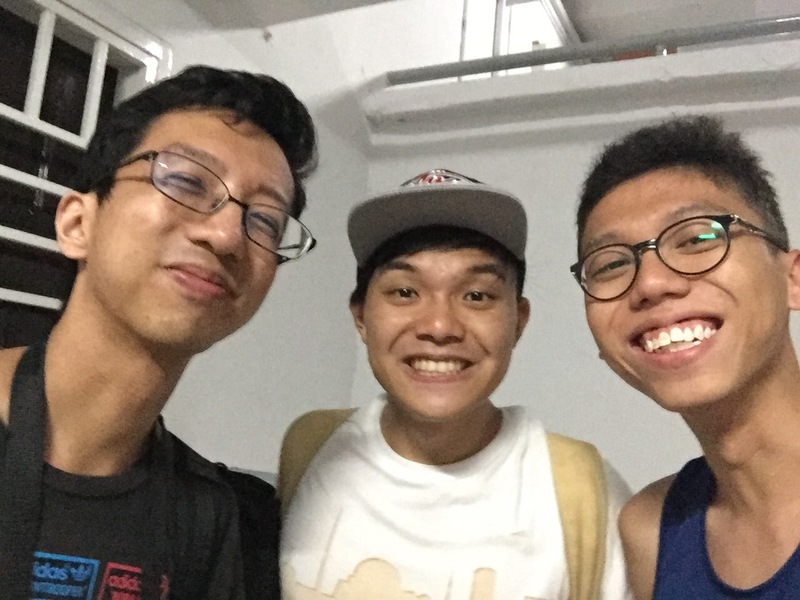 As a last measure, I give my friend a call and ask him what he thinks… you know – for pedals – someone like Aaron Cheong. Haha. What is it exactly that I’m looking for when I act like this? What exactly is the opposite of doubt? The opposite of doubt is… Trust. If Aaron tells me the pedal bad through and through, I’m staying away. He’s been through more pedals than me, and knows better. If he tells me it’s terrible, but it’s a personal bias, and I need to give it a shot to find out, then it’s a 50-50… Should I take the plunge? If he says it’s great, well, take my money. You see, at the end of the day, it isn’t about what I read or what I hear, it’s about who I trust. Trusting the wrong people is going to get me into deep deep trouble. Trusting the wrong person could leave me with a $300 paperweight. You’ll have to trust me before we get on the same boat together, or we may both end up at the bottom of the sea. Now, that’s a lot of ships not to sink. They then take a leap of faith. But when it comes to God, I’m learning to trust Him even more each day. If I’m going through a rough patch in life, in addition to having faith, I need to trust in God’s character – that God will bring me through the season. That He is with me and for me, even if I don’t feel it. When it comes to people… I’ve learnt that it’s human to have doubt. But I’ve also learnt that people use doubt in order to earn trust. It’s like how in business, people speak badly of their competitor’s products so that you’ll get theirs. I’ve learnt to give my trust to people who have the character to walk upright… because if someone is willing to backstab or speak badly about another, then who knows when they’ll turn their back on you? Be wary of those who use doubt in order to earn your trust, because it speaks so much more about them than anything. I’d rather trust someone who makes mistakes, but has the character to walk upright, than someone who sows doubt, anytime. This comes as a real shock to me because, I’ve never hated a smell in my life. NEVER. I mean, I’m a fan of Durian and Smelly Tofu… My house sits right beside the garbage dump (and the garbage dump in the estate next door). Every noon I’m educated to what a Rafflesia flower might smell like – I could live with that. Once in Secondary School I played a game of chicken with Zu Kai, to see who could outlast the other in a toilet cubicle with a choked toilet bowl. I’ve never flinched at a smell… Until now. I’ve always imagined truffle fries to taste like cheese (since it looks like it). Surprisingly, I’ve downed a basket of truffle fries before, but the smell never hit me this bad. However, it all started last week at a wedding dinner when I was introduced to a bowl of truffle soup. I exclaimed that it was some sort of snow fungus thing… Little did I know I was being introduced to my newly uncovered nemesis… Truffle. I did my research (google) today, and I’ve learnt that truffle isn’t far from snow fungus. THEY’RE BOTH FUNGI. 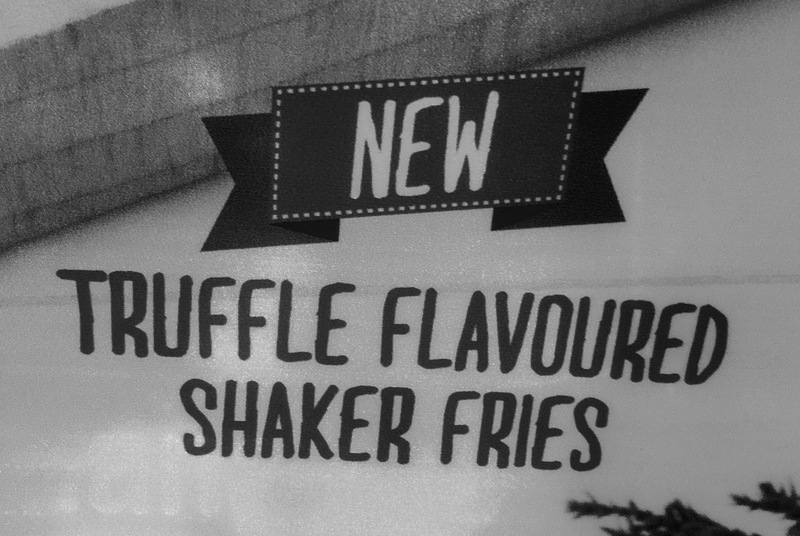 Yesterday, I dipped my hand into a packet of truffle shaker fries to make sure that I wasn’t just making a big fuss out of nothing. The truffle powder has embedded itself under my fingernails, and the pungent odour continues to haunt me as I type this dessertation (har har, I’ve not lost my sense of humour, but I’d like to lose my sense of smell now, thank you). As I lay down, suffocating under the influence of truffle, I let out a cry… Why God? 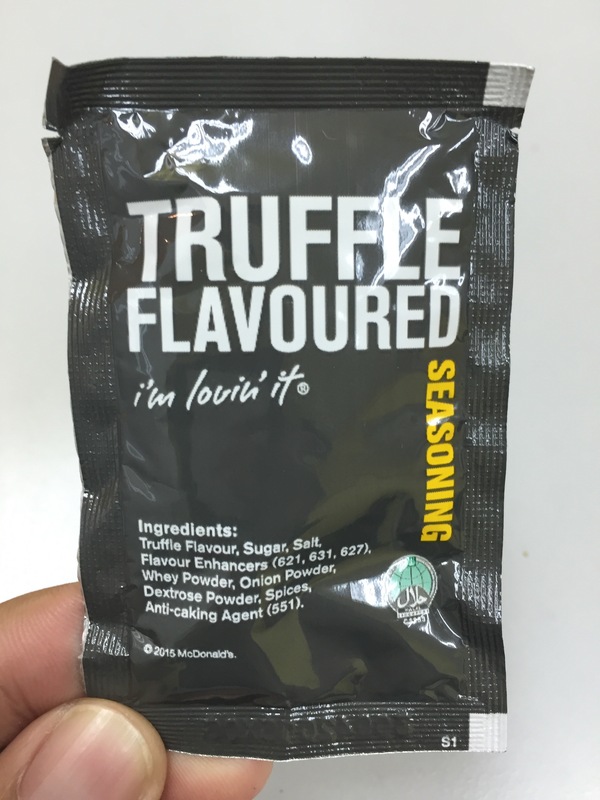 Why truffle now? After 26 years… Why now? It’s like… Kryptonite. Strangely, the familiar still small voice spoke to me. These few days, I’ve been wondering why the world can’t just agree and get along. Why is everyone so unwilling to share each other’s point of view? Why can’t everyone love truffle?! To some people, somethings are as suffocating as truffle is to you. It’s not even about being understanding… the very smell of truffle goes against your entire being. But just because you can’t stand truffle, doesn’t mean others will feel the same way. That’s the way people are, and isn’t that something special? I boarded the wrong bus in a last-ditch attempt to get to a bus stop to catch the last 197 (I already missed the train). Turns out this bus was headed in the opposite direction of the loop. And now, I find myself in… Hougang. It’s getting late, maybe I should just flag a cab and head home. But no, Something tells me to take a breather instead. My legs start moving. They know where to go, this is a path I’ve tread many times. I cross the road outside the MRT station, heading deeper in. I start praying to God, knowing where this road would eventually lead. What do you want to show me tonight, God? Finally, I approach two tall blue gates. Closed. No surprise, since it’s one in the morning. Every time, I’d stop at this exact spot, never going beyond the gates. I wonder what it felt like to be able to walk past them. A snarling noise (the uncle’s throat clearing before a spit) startles me. I turned around to see an uncouth man headed in my direction. The cool night breeze carries me along farther. I’m met by some youngsters (about four of them squeezing around a table), downing bottles of beer with puffs of cigarettes. Isn’t drinking out in public at this time against the law? I’m tempted to google ‘new alcohol law’, but decide against it. That’s not why I came here tonight. My legs don’t stop. My thoughts race back to the young men at the void deck. Maybe he’s there with them. Before he started guzzling cigarettes and hanging out with the wrong company, he was just like any ordinary school kid. An ordinary boy, who went through the tall blue gates every weekday for school (if he didn’t oversleep). He had a dysfunctional family. His dad was always angry, and pulled him out of a prestigious school for ‘misbehaving’. The only wrong this boy committed was to be bursting with energy. Everywhere he went, he was running and jumping. That was then. Fast forward a few years, he had dropped out of school. A gang took him in at his lowest. They took him in, but when the time came to bail him out of jail in the middle of the night, I was the one who took him out. Who knows what to expect from a call at two in the morning, right? In the distance, I see a block where someone else I know lives. Hmmm, wonder if he’s awake. He used to say we were really similar, and that’s why we were friends. We would sit together to talk, or sometimes sit in silence, for hours. He was battling depression. On his good days, he’d have some pretty healthy thoughts. He’ll definitely get better if he keeps this up, with his medication. Then there’d come the bad days, when all reason is thrown out the window. Well, you don’t walk away when someone has bad days. You just keep being there, because you take a person both in their good and bad days. However, the bad days soon outnumbered the good ones. Nothing I said helped. I persevered on. Then, the talking stopped. 13 Though I speak with the tongues of men and of angels, but have not love, I have become sounding brass or a clanging cymbal. 2 And though I have the gift of prophecy, and understand all mysteries and all knowledge, and though I have all faith, so that I could remove mountains, but have not love, I am nothing. 3 And though I bestow all my goods to feed the poor, and though I give my body to be burned, but have not love, it profits me nothing. Would I do it again, God? I would, over and over again. You see, the Word of God isn’t just some motivational or inspirational quote to paste on my wall. Even if the world misunderstands, or fails to understand. Over, and over again I would love. Because even in days with little faith and hope, love carries on – it carries on, over and over again. Call me a fool. Why did the recent horrific attacks gain more media attention than the ongoing devastation in war-torn nations? That question has been thrown around a lot these past two days. If we take a step back and be clinical about it, perhaps, there are less journalists willing to put their life on the line to constantly bring back stories from afar. If you ask me, maybe the majority of the people reading the news would not be able to fully empathise with what’s going on from behind their screens. The reason to me, however, is hauntingly simple… It could have been you and me. A Friday night routine, heading to the theatre. Enjoying a coffee because TGIF. Walking along a bustling city street… It could have been you and me. Our notion of safety and security in our every day life is subverted. Deep down, there’s a tinge of fear… Reading the news this morning, it said that Singapore is not spared from being a target. That turned my stomach a little. It could have been you and me. Or rather, it could still be you and me. So, let us not be quick to raise our flags and point out, of how everyone has forgotten about another part of the world, just because of hashtags or a splash of colour on their profile picture. It is not time to point fingers, but to take hope, instead, that perhaps we are still able to rally together to make this world a better place – that you are alive and well, to stand for your cause another day. Paris, Beirut, Baghdad, Japan… Our hearts are with you… When all is lost, hope remains. 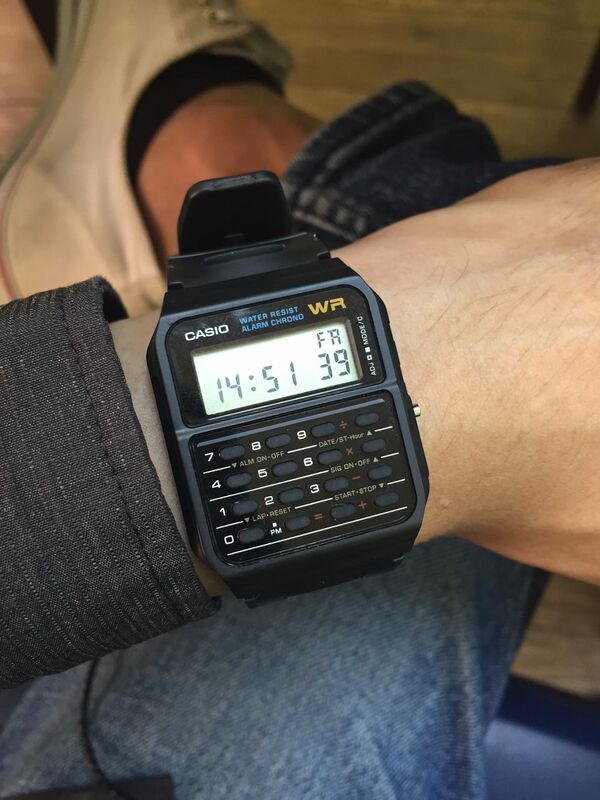 As I watched Our Times (我的少女時代) I noticed Hsu Taiyi was wearing a Casio Calculator CA53W watch… I have one too! You will see in the show that he almost never takes it off, and the things he’s been through show how hardy this watch actually is. Also, watch this video if you liked the theme song! There’s something about this… It’s like David Cook doing Always Be My Baby. Hahahaha. This is the true joy in life, the being used for a purpose recognised by yourself as a mighty one; the being thoroughly worn out before you are thrown on the scrap heap; the being a force of Nature instead of a feverish selfish little clod of ailments and grievances complaining that the world will not devote itself to making you happy. Reminded of this… Pastor Lia shared this back in the sermon on Significance. Are you significant? Or merely successful? This weekend, Pastors will be back in Heart of God Church after visiting Russia! So excited to hear about the missions. I order the same food almost everyday – brown rice, chicken, and egg. The aunty at the store doesn’t even bother to ask me what I want anymore… She just proceeds to fill the box up. Does that make me a boring person? A predictable person? I guess sometimes, consistency is a good thing. Maybe, I’ll try that other store tomorrow… Maybe, not.